BYD, backed by Warren Buffett's Berkshire Hathaway Inc., had planned to open the site this year in Ontario with about 40 workers. 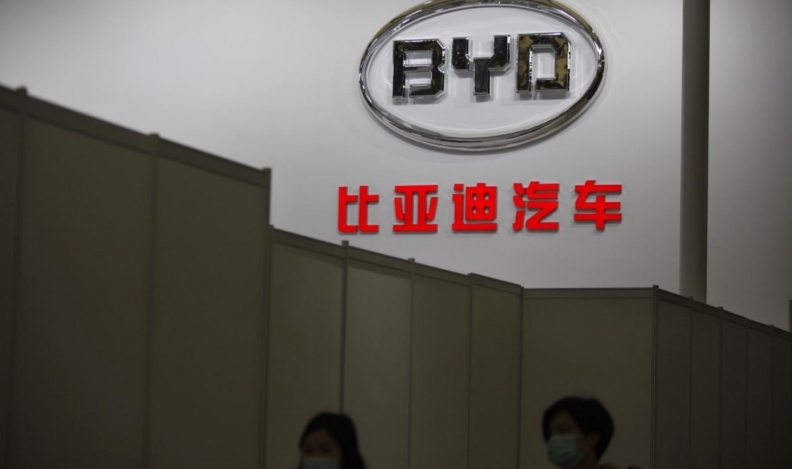 TORONTO — China’s BYD Co. Ltd. has put plans to open its first Canadian electric truck plant on hold but could revive the project when the electric vehicle maker sees a business case, a company executive said. BYD, backed by Warren Buffett’s Berkshire Hathaway Inc., had planned to open the site this year in Ontario with about 40 workers, a boost to green manufacturing in the country’s most populous province. Dowling did not give a specific reason for the decision to suspend the plan, but noted that the company had made more progress winning Canadian orders for buses than trucks. He said BYD’s decision was not related to Ontario’s move on July 3 to scrap the province’s incentives for green vehicles and its cap and trade program, which required companies to buy allowances for some greenhouse gas emissions. Dowling expects Ontario’s newly elected government will roll out a new program that could be better than the old scheme. When the plan was first reported, BYD’s trucks had not been approved to operate on Canadian roads. BYD announced that approval on June 26, shortly before right-wing populist Doug Ford took office as Ontario’s premier. The provincial government said in an email it had cancelled cap and trade to bring down gas prices and lower costs for families and businesses, and as a result the incentive program ended. Transport ministry spokesman Bob Nichols said Ontario would release a new environment plan later this month. A new truck plant would have been a small boost to Canada’s auto industry, which has lost jobs to the United States, where governments offer manufacturers rich incentives, and Mexico, where labor costs are lower. BYD’s assembly plant in Lancaster, California started with about 100 workers in 2013, and now employs close to 1,000, Dowling said. The Canadian auto sector was shaken this year when U.S. President Donald Trump threatened tariffs on Canadian vehicles. About 85 percent of cars made in Canada in 2016 were exported. The draft U.S.-Canada-Mexico Agreement leaves significant room for Canadian plants to grow exports duty-free. In July, BYD landed an order from the Toronto Transit Commission, the country’s largest transit operator, for ten buses with an option for 30 more. Canadian grocery store operator Loblaw Co. Ltd. tested BYD’s vehicles last year. Loblaw is hoping to place an order next year, it said in a statement. Buffett bought 10 per cent of BYD in 2008 for US$230 million, and the company’s market capitalization has since topped US$20 billion, thanks to China’s booming electric car market.